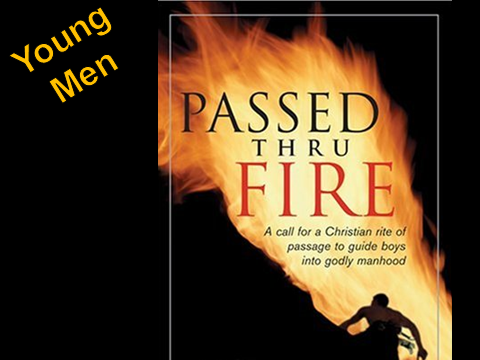 Passed Through Fire is a class for young men between the ages of 13 and 18 that teaches them what it means to be a man and serves as a right of passage for their transition into manhood. This ministry seeks to counteract the negative messages of society regarding what manhood is by teaching young males what it means to be men of God at home, in society, and in the church. The class is 6 weeks long, consisting of video teachings and small group discussions followed by a wonderful, emotional, and powerful weekend retreat to conduct their right of passage. The classes are held on Wednesday nights from 7-8:30 pm during the Fall, and the cost is $79 per person. The class is limited to 8 participants, and the boys' fathers are welcome to be actively involved in the class as well (though this is not required).